I really want to show people that going vegan doesn’t always have to mean making big changes to your diet or the foods you eat. Of course some people choose to embrace the whole raw vegan way of eating and that’s great, I wish I could do it! But I think that is what puts some people off turning vegan, they think it means living on leaves, or that it means you have to spend a lot more time in the kitchen. I actually watched a video of someone talking about the pros and cons of eating vegan this January and one of the cons was that she had spent a lot more time in the kitchen as she was making everything from scratch. She was making full meals or soups from scratch at lunchtime, of course you can do that, and it’s nice to do it sometimes but I certainly don’t have time to be cooking from scratch for every meal. And the good news is that you don’t need to! 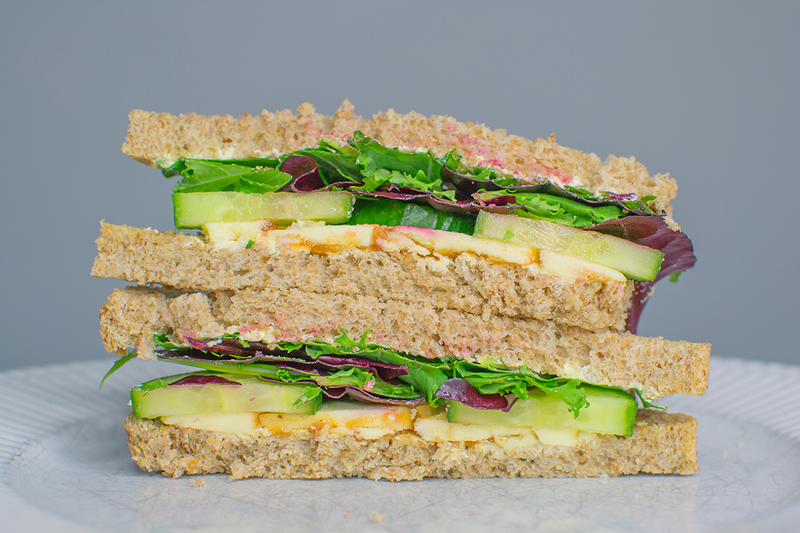 I love sandwiches for lunch and definitely wouldn’t have wanted to give them up, they are so quick and easy and generally the thing that I eat most days of the week. So in this post I wanted to share with you my 3 favourite vegan sandwich fillings, they are super quick, easy and delicious. First up is a great classic, vegan cheese and chutney. I have to admit that I hadn’t eaten this combo until last week when I discovered a vegan cheese that is so close to cheddar. Previously I had been using VioLife which was okay on burgers but it never really had the same tang as cheddar, and this one does! The cheese I am talking about is the Asda free from mature cheddar alternative, I blogged about it here and did a little taste-test video which you can also find in the blog post. After enjoying cheese and crackers with it, I then made a cheese and chutney sandwich and it was so good! My second favourite vegan sandwich is stuffing slice, cranberry sauce and avocado. It sounds a bit like a festive sandwich but we eat it all year round as it’s such a good comb. I use the Vbites sage and onion slices which taste just like stuffing. I buy them in Morrison’s and they only cost about £1.37 a pack so really good value. You can also buy then online here. If you can’t find those then Tofurkey slices would work or even just cold stuffing if you had some left over from a roast dinner. Then my third favourite, and possibly one that is a bit random, is mango chutney and houmous. I just love the sweetness of the mango chutney with the houmous, it’s super scrummy! Add in some crunchy salad and it’s one delicious sandwich, and one we always have the ingredients for so the one I eat the most.